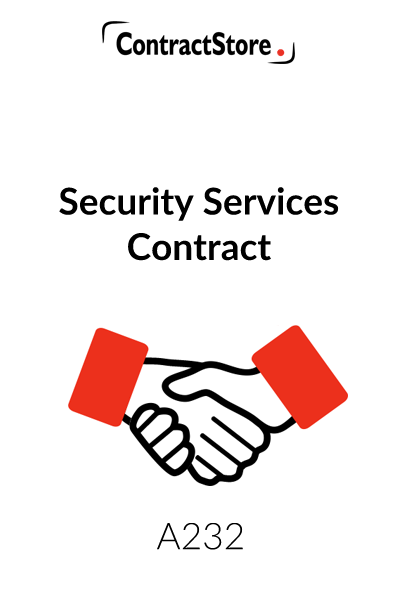 Who can use this Security Services Contract? This Security services contract template is designed for use by a business providing security services or security guards. What is this Security Services Contract for? 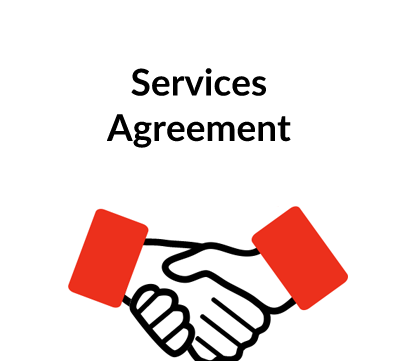 It sets out the terms agreed between the business and the client with a short one-page agreement plus terms of business and schedule which will be completed each job detailing the services and the charges. This arrangement allows a security firm to provide the terms of business separately from the Form of Agreement when it is tendering for work. Once the details have been agreed they can be set out in the Schedule and the one page Form of Agreement signed by each party and attached to the Terms of Business and Schedule. Clause 1.2 makes it clear that these terms are the only ones that apply to the contract. This sets out the basic obligation of the Company to provide the services that are set out in the Schedule. It is the responsibility of the Company to provide all equipment (except for those, if any, specified in the schedule) and materials including uniforms. Note that if the Company wishes to put up notices stating its identity and function these notices must be approved by the Client. The wording assumes a 12 months contract which will automatically be renews unless terminated. Any different period should be set out in the Form of Agreement. This clause contains the default position for invoicing and payment. Any special terms should be put into the Schedule. Clause 4.2 deals with additional services. Clause 4.3 requires the client to query invoices within 5 days. Clause 4.4 provides for interest if payment is late. The law referred to here allows a firm to claim interest at the rate fixed by the government and which at present is around 8% above the Bank of England Base Rate. Price increases are dealt with in Clause 4.5. In practice, it is going to be necessary for the agreement of both parties to agree any increase in charges before they are implemented. This clause contains some general obligations on the Company, in particular that it has obtained references from its staff. 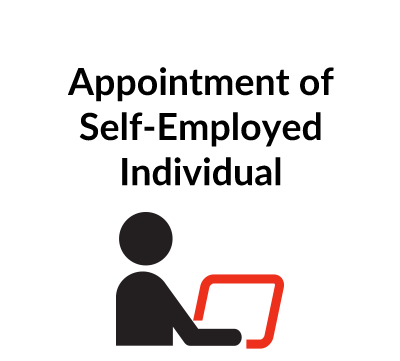 Most importantly, taking into account the nature of the services to be provided, the Company is obliged to obtain Criminal Record Bureau checks on all staff and to ensure that such staff hold the necessary licence to undertake the work agreed. The Company is required to maintain adequate Public Liability and Third Party Insurance (but see also the limitation of the Company’s liability to the extent of that insurance cover at clauses 7 & 14). The clause deals with a number of practical matters designed to ensure that the Company’s staff can get access at the agreed times and they know how to deal with the fire alarm and any other security systems. In addition, the Client is required specifically to ensure compliance with health and safety requirements. To ensure the smooth working of the contract the Client should advise the Company of the names of the Client’s senior managers who shall have authority to issue instructions to security staff. This is designed to ensure that the Company’s liability for loss or damage to the Client’s property only arises if there is proven default on the part of its staff. The Company should maintain adequate public liability insurance policy to protect it against this risk. Bearing in mind the nature of this contract the definition of the Client’s property includes lost/damaged or unusable security equipment. It is sensible to have a time limit within which the Client may raise any complaints. While this clause contains appropriate wording, if the Client does not raise a complaint within 3 working days, the Client might still have a potential claim against it. If the Client does not pay, this clause gives the Company the option to suspend the contract rather than terminate it altogether. 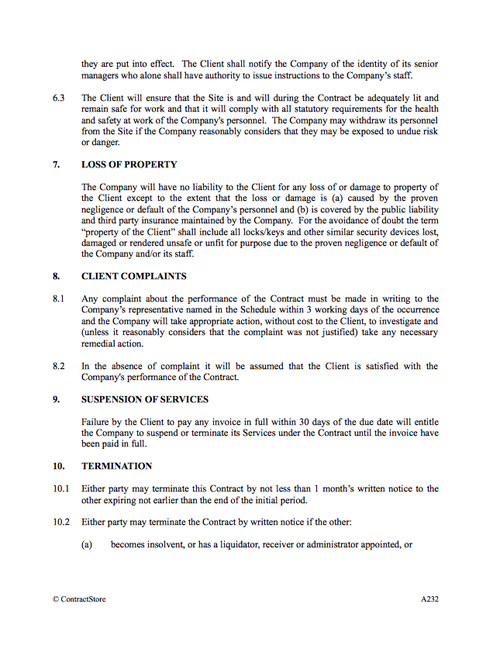 A Company seeking to suspend the contract should give written notice to the Client setting out the reasons for suspension. Under 10.1 either side can terminate on one month’s notice once the initial period (of 12 months) has finished. If you want the contract to run from year to year, then the wording would need to be change or alternative arrangements set out in the Schedule. Clause10.2 allows either side to give notice to terminate if the other party becomes bankrupt or commits a breach of contract. At clause 10.3 the Company is obliged to remove its signs from the Client’s premises subject to the Client giving co-operation as to access. Circumstances beyond the control of the Company would allow it to avoid its obligations under the Contract for a period of up to 30 days. Whether a client would accept that shortage of staff is a “force majeure” event is a matter of conjecture, but on the face of it, this clause should give some protection to the Company in such circumstances. ‘Industrial action’ including strikes affecting the Company are included in the definition of Force Majeure. Under clause 11.2 if the Force Majeure continues for more than 30 days, either side can give 30 days notice to terminate the Contract. Since the Company and its employees might have access to confidential information relating to the customer, the clause is designed to give some comfort to the customer… Please note the standard exceptions to the right to confidentiality. Please note that this obligation is mutually binding. It is not unusual in the security industry for clients to ‘poach’ individual security staff thus damaging a security firm’s ability to operate effectively. This clause is intended to prevent the Client from offering work to the Company’s staff both during the contract and for six months after it comes to an end. A breach by the Client entitles the Company to claim compensation as set out in the clause. Bearing in mind the relatively low levels of fees charged by security firms and the potential for considerable losses arising from their breach or negligence such firms will refuse to accept liability in excess of what they can recover from insurance. This clause is therefore designed to limit the Company’s liability, first by excluding liability for indirect losses incurred by the Client and secondly by capping the liability for breach of contract to an amount equal to three months’ fees. Since it is not permissible by law to limit liability for death or injury, this risk is unlimited. Under 16.1 the wording makes it clear that any previous arrangements or agreements are of no effect once the contract is signed. Under 16.2 if one of the parties is let off the hook after committing some breach of the contract that does not prevent the other party from later taking action against it. Under 16.3 third parties e.g. clients or customers of the Client are excluded from enforcing any statutory rights to claim damages for breach of contract or to enforce a term of the contract. Under 16.4 if one of the terms of the contract became invalid for some reason, this clause deals with the situation. Under 16.5 neither the client nor the firm has the right to transfer the contract to somebody else. Here the scope of the services should be set out in some detail: e.g. the length of the initial period of the contract, alternative invoicing arrangements, the days/hours that staff are required, the specific roles of staff, enhanced rates for week end/public holiday working. ‘Additional Services’: this may include security cover required for ‘one off’ events such as evening functions/presentations taking place outside the Client’s normal working hours.